Just the Right Size: Why Do I Can and Preserve? Why Do I Can and Preserve? I often get asked if it’s really worth the time and money savings to can and preserve your own food. In fact, this discussion is often passionately discussed on my beloved Harvest Forum. Initially, it’s expensive. You have to buy all the equipment and jars, and if you don’t grow your own food, you have to buy some, if not all of that as well. It takes a lot of time to pick, peel, pit, cut, cook, and eventually process home-canned food, so there’s that. Eventually, you build up a stash of jars and lids and all you really need to do is buy or grow the food, but even then it’s questionable if there truly is savings. Sure, there can be a small amount of savings if you regularly buy the high-quality, organic canned items in the store, but not much when you factor in the time and effort. Time = money and all that. 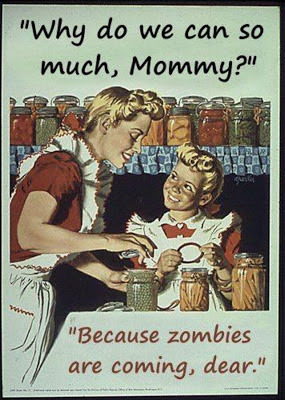 In truth, there really isn’t that much savings in canning and preserving my own food on an average to small scale. I can and preserve for my husband and myself, plus a few family members and friends as gifts. We have a very small, soon to be prosperous garden, but definitely not enough to feed us completely. We both work full time 40-plus hours a week, so neither one of us have the time to devote to full-time, self-sufficient food preservation. I can and preserve because I know EXACTLY what is going in my food and can truly guarantee its ingredients and preparation. I can and preserve because it’s healthy. I can and preserve because I know that what I make tastes a gazillion times better than what I can buy in the store. I can and preserve because I know that the food I’m using didn’t travel 1,200 miles to get to me. I can and preserve because nothing beats the feeling of satisfaction I get from looking at all those pretty jars of yumminess lined up on my shelf…yumminess that I made for my family and the people I love and care about. That pretty much sums it up for me. I think it is more the intrinsic value of the canned goods. For me, there is a huge sense of satisfaction in knowing I grew and saved those items. That I'm feeding my family with the actual fruits of my labors. Above all this, I'm in awe that God designed those itty bitty seeds to produce so much! Even if you only get one zucchini (laughable), how much more than that one seed? Saving those blessings for the depths of winter is rewarding. That pretty much sums it up for me too!